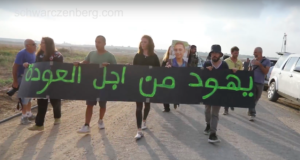 This Saturday, as has been done every Saturday for over a month, International and Israeli activists joined Hamad and Jabber Soleiby and their families as they worked their land in Saffa, near Bat ‘Ain settlement. This Saturday, however, both the Israeli army and settlers from the right-wing extremist settlement were ready and waiting. While soldiers stood by and watched, settlers threw rocks at the farmers and solidarity activists and rolled boulders down into the agricultural land. Soldiers then shouted across the small valley to the solidarity activists, telling them it was a closed military zone and the people would have to leave. While the farmers and solidarity activists agreed they would leave if ordered to, attempting to avoid a confrontation such as those that had occurred the previous two weeks, they still demanded that the settlers were forced to leave at the same time, fearing they would do damage to the agricultural land after the farmers left the area. After the solidarity activists and farmers began to leave the area, soldiers and border police ran up from behind the group and grabbed the youngest farmer. When international and Israeli activists from Palestine Solidarity Project and Anarchists Against the Wall objected, the soldiers began indiscriminately beating the solidarity activists. Internationals were placed in choke-holds, thrown to the ground and had their heads smashed into rocks. Israeli activists were dragged by their hair and all were beaten with batons while trying to protect the Palestinian farmer. 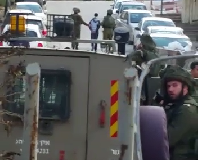 Finally, the soldiers managed to pull the Palestinian farmer away from the activists, who were held on the ground by several soldiers and border police. 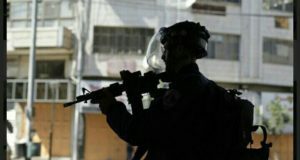 In the end, the Palestinian was only questioned and asked to show his ID before being released, while one American-Israeli from Palestine Solidarity Project, and a Scottish National and a German national from International Solidarity Movement were all arrested and accused of attacking soldiers and border police. While in custody, the Scottish national was attacked again by one of the border policemen, who grabbed him by the throat and threw him against the wall while in the Qiryat Arba police station. Even though the aggression and violence was clearly on the part of the border police and soldiers, the three activists were still brought before a judge in the Jerusalem “peace” court, where they were all given conditional releases pending a further investigation of the allegations.